This is how an everyday dish becomes not so everyday! The hash-brown binder gives these salmon cakes an extra crispiness. Squeeze some lime juice over them and add a nice dollop of the lime-dill sauce...oh, yummy for the tummy! Whether you serve them as an entree or as a salmon burger, you'll love how easy this dish is to prepare (especially for weekdays) and find them a real family and friends' pleaser! Hope There's Not Too Much Rush-Hour Traffic! In a large bowl, combine the hash browns with the chopped green onions. Add the salmon, eggs, dill weed, mustard, pepper and salt to the hash-brown and onion mixture and combine well. Using your hands, form the mixture into six equal patties and refrigerate them...you can refrigerate either just the mixture or the cakes overnight if you prefer. Whisk together all the ingredients for the sauce and refrigerate. Carefully place the patties into the pan. (I use my hands to avoid their falling apart too much.) Don't crowd the patties. Cook both sides of the cakes until well-browned and heated through, about 2 to 3 minutes per side. If necessary, keep them warm in a 200º oven. Serve the cakes with the lime wedges and lime-dill sauce as an entree or as burgers. (I like to eat them with a lot of lime juice and a nice dollop of the sauce!) Absolutely delicious and sure to haunt you! Enjoy! This sounds very tasty. I like the hash browns in with the salmon! We do a lot of fish cakes, too, and yours sound fantastic. Love the addition of hash browns. And that sauce? The perfect accompaniment. Well done, Bonnie! I don't think I have ever had salmon cakes! These sound fantastic, especially with the lime-dill sauce! @Jill/Dulce Dough - Hey, I think they're a Southern dish mostly. Please try them...they would be great for your family! Gotta have the dill sauce with the cakes, and it would also be good with other dishes too or as a veggie dip! Enjoy! That lime-dill sauce looks fantastic! @Lora - It is so good and would be great as a dip or with other seafood dishes! Thanks for stopping by and look forward to seeing you again! Enjoy! Oh wow...I wish you could make me this tonight! I feel too tired to cook but these look amazing. Thank you for sharing...and thank you for all the support. It means more to me than you know. Hugs and love from Austin. @Monet - That you stopped by to say hello means a lot to me, especially when you're so burdened. I would love to make them for you and serve them along with a big hug! YUM!!! With Lent approaching, I've been on the lookout for easy non-meat entrees! These lovely salmon cakes would be perfect!!! Have a lovely week, my friend! @Lizzy - Hi! They would be great for Lent! I've been curious about using the boneless and skinless salmon, and my daughter found a reasonably priced 6 oz. can at Trader Joe's. I think if I use two cans of that in my recipe, that will suffice...I'll let you all know. Enjoy! This is my kind of food. 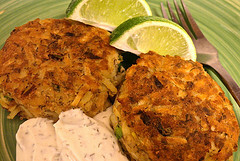 I love salmon cakes and the hash browns are a great addition! @Cassie/Bake Your Day - I'm so glad you like this! On Monday of last week, I served salmon patties. I used your recipe for the lime-dill sauce; however, I fixed the patties in the usual way but just adding the dill weed made them wonderful, Bonnie!!! That sauce is just spectacular. I've never tasted a better sauce than that -- better than any hollandaise sauce I've eaten, even in a high-class restaurant! Since there's only my husband and I at home now, we had enough of that wonderful sauce to use on Thursday over broiled salmon steaks and steamed asparagus spears. I think you really deserve an award for this recipe! Hi Betty! I feel like I've won an award with your amazing comment! It's so great to have such wonderful feedback! I'm so glad you loved this sauce and found it so versatile! Please drop by anytime! Hi Greg! Good to see you...these cakes are so good! Making them again next week for my daughter's family...going to try Trader Joe's boneless, skinless, canned salmon and will let you all know how I like their product. Please come again!